The septic system is an effective, long-standing method for collecting, treating, and disposing of sewage from rural and suburban homes and businesses. Septic systems are used in every county in North Carolina. Nearly 50 percent of the state’s homes have them. This fact sheet will answer some typical questions about septic systems and their maintenance. Septic systems are used when centralized sewage treatment plants are not accessible in a community. They safely treat and dispose of wastewaters produced in the bathroom, kitchen, and laundry. These wastewaters may contain disease-causing germs and pollutants that must be treated to protect human health and the environment. Septic systems are usually a permanent solution to wastewater treatment and disposal. Therefore, they must be properly used, operated, and maintained by the homeowner to assure the long-term performance of these systems. Even when used as a temporary wastewater treatment solution until sewer lines are extended to a community, special care and maintenance are needed for septic systems so that they don’t pose a risk to public health or the environment. Several different types of septic systems are available, each with its own design. The traditional, conventional system is the one that has been most commonly used in North Carolina up until the past decade (Figure 1). It consists of three main parts: the septic tank, the drainfield, and the soil beneath the drainfield. The septic tank is a watertight container about 9 feet long and 5 feet tall. It is buried in the ground just outside the home. The tank is usually precast from reinforced concrete, although tanks made from plastic or fiberglass may be seen on occasion. While a tank is typically designed with a 1,000-gallon liquid capacity, its size is legally determined by the number of bedrooms in the home. The tank temporarily holds household wastes and allows a small amount of pretreatment to take place (Figure 2). Figure 2. A two-compartment septic tank. All of the wastewaters from the home should flow into the septic tank. Even waters from the shower, bathtub, and washing machine can contain disease-causing germs or environmental pollutants. 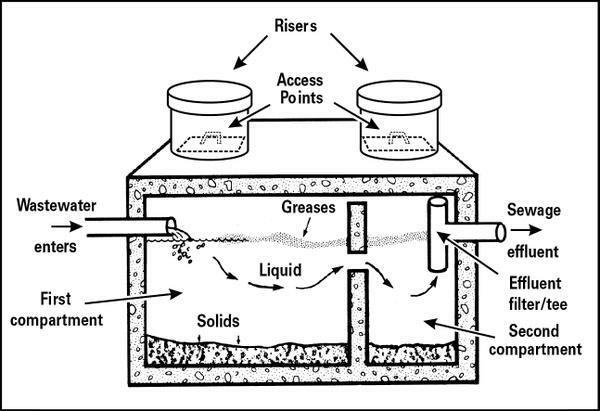 As wastewater flows into the tank, the heavier solid materials settle to the bottom (forming a sludge layer), and the lighter greases and fats float to the top (forming a scum layer). The tank’s primary purpose is to retain the solids. After a retention time of about two days, the liquid portion (the sewage effluent) flows out of the tank through the outlet pipe. The retention time is necessary for separation of the solids from the liquid and for anaerobic digestion of the solids to begin in the septic tank. An outlet baffle (or a sanitary tee at the outlet end) prevents solids from flowing out with the liquids. Newer septic systems installed since 1999, however, include an effluent filter in the septic tank. These are installed in place of the sanitary tee at the outlet end of the septic tank (in the second compartment shown in Figure 2). What Happens in the Drainfield and the Soil? The purpose of the drainfield is to deliver the liquid sewage effluent to the soil. The real treatment of the wastewater occurs in the soil beneath the drainfield. Sewage effluent flows out of the tank as a cloudy liquid that still contains many disease-causing germs and environmental pollutants. Effluent flows into the perforated pipe in the trenches, passes through the holes in the pipe, and then trickles down through the gravel to the soil (Figure 3). There are also “gravel-less” trenches used where plastic louvered chambers, polystyrene aggregate, tire chip aggregate, or large diameter pipes are used in place of the gravel aggregate. These materials provide a void space in the trench to allow distribution of the effluent to the trench bottom. As sewage effluent enters and flows through the ground, soil particles filter out many of the bacteria that can cause diseases. The soil adsorbs some of the smaller germs, such as viruses, until they are destroyed. The soil can also retain certain chemicals, including phosphorus and some forms of nitrogen. A special zone, called a biomat, forms in the upper 1 to 6 inches of the soil at the soil/trench interface just below the trench bottom. This biomat zone is useful. It helps remove many of the germs and chemical pollutants. If the solids accumulating in the septic tank are never pumped out, however, they can flow into the trenches and accumulate into an intensive biomat that becomes too thick. When that happens, the biomat completely clogs the soil and does not allow the sewage effluent to flow out of the trench. An improperly maintained system will fail and cause untreated sewage to completely fill the trenches and come out on top of the ground or back up into the home in its plumbing system. Figure 3. Wastewater treatment and disposal in the soil. Where Can a Septic System Be Used? A centralized sewer system with a large sewage treatment plant usually discharges treated wastewater into a body of water. 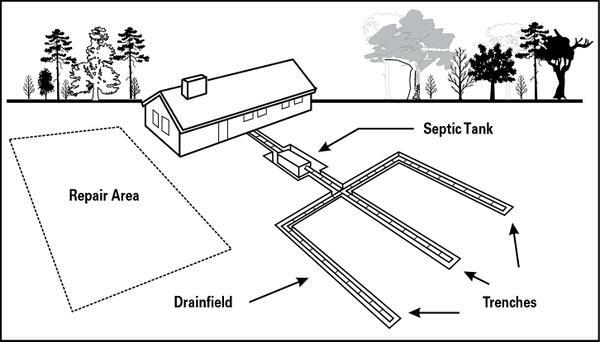 On the other hand, a septic system depends on the soil around the home to treat and dispose of sewage effluent (Figure 3). For this reason, a septic system can be used only on soils that will adequately absorb and purify the effluent. If a septic system is installed in soil that cannot do so, the effluent will seep out onto the soil surface overlying the drainfield or back up into the home. In addition to causing an unpleasant smell, this untreated sewage can pose health problems. In some cases where the soils do not adequately absorb the wastewater, the toilets and sinks might not drain freely. If the soil can absorb the effluent, but not treat it, or if the trenches are installed directly into groundwater or bedrock, the sewage may contaminate the groundwater. 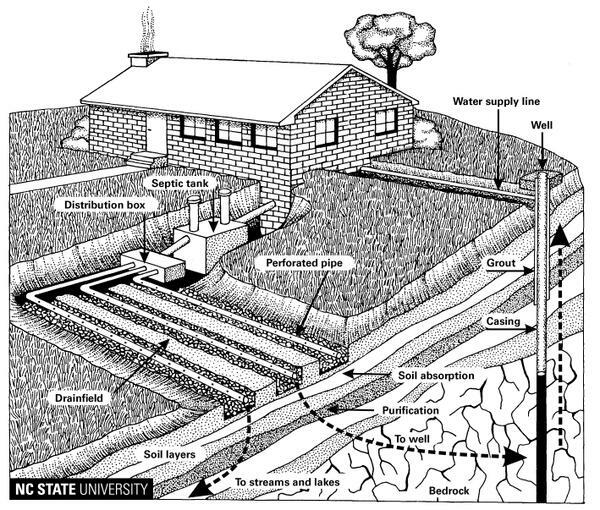 Because the underlying groundwater serves as the source of drinking water for your well or possibly your neighbors’ wells (Figure 3), it is very important that the system be installed in the proper soil conditions and that the septic system is correctly used, operated, and maintained. What Kinds of Soil Conditions Are Best Suited to a Conventional Septic System? Gently sloping, thick, permeable soils with deep water tables make the best sites for the traditional, conventional septic system and simple modifications of it. The soil should be a uniform brown, yellow, or bright red color. It should not have spots of gray colors that often indicate the soil becomes excessively wet or that groundwater comes up close to the ground surface during the wet times of the year. The soil texture should be neither too sandy nor too clayey, and it should have good aggregation, or structure (that is, a handful of the soil should easily break apart into small aggregates). Areas that are unsuitable for conventional septic systems have rock close to the surface, very sticky clays, soil layers that restrict the downward flow of water, or areas with shallow groundwater. These factors would prevent a conventional septic system from working properly. What About Other Types of On-Site Systems That Are Alternatives to the Conventional System? Other types of on-site systems are sometimes used on sites where the soil is not suited to a conventional system. Where soils are too wet or too shallow for the conventional system, the drainfield might be placed very close to the ground surface in the upper layers of the soil. In some wet soils, artificial drainage around the septic system lowers the level of the shallow water table. On some clayey soils that have a thick sandy surface, the low-pressure pipe (LPP) system provides an alternative. On some soils that are not deep enough to provide adequate treatment of the sewage effluent, it may be possible to use an advanced pretreatment unit to supplement the soil’s treatment capacity. Examples are fixed media biofilters such as a sand filter, peat filter, textile filter, or porous foam biofilter or mechanical aerobic treatment units that bubble air into the sewage itself. Most of these pretreatment units are installed between the septic tank and drainfield. They provide better purification of the wastewater than is provided by the traditional septic tank alone. Some sites may need more sophisticated methods of distributing the sewage effluent within the drainfield itself using a pressure manifold, LPP, or drip irrigation system. These systems use pumps, special controls, and specially designed pipe networks that can improve the wastewater treatment in the soil. In other situations, it may be cost effective to collect the wastewater from several homes in an area or subdivision by using a cluster system. This type of system has a drainfield located in a common area within the best-suited soils in the tract of land. These newer and more sophisticated types of on-site system options can often provide a better wastewater treatment solution for a particular building lot, or a tract of land, than either the traditional, conventional septic tank system or large-scale, centralized public sewers. How Do I Know if My Site Is Suitable for a Septic System? North Carolina has more than 400 different kinds of soil, and a 1-acre lot can contain several different soil types. Because many of these soils are unsuitable for conventional septic systems and even unsuitable for more advanced or alternative on-site systems, you should always obtain an improvement permit (I.P.) before purchasing a lot that you intend to build on. You will submit an application and a site plan to the county health department. The environmental health specialist (sanitarian) will conduct a comprehensive soil and site evaluation and either issue or deny the permit. If an I.P. can be issued, you will also need to obtain a construction authorization (C.A.) before a building permit can be issued. If you are interested in developing a tract of land to subdivide, you should hire a licensed soil scientist to conduct preliminary evaluations and advise you on the location of suitable soils and lot configuration. You can obtain additional information from the Cooperative Extension publication AG-439-12, Investigate Before You Invest. How Large Is a Typical Drainfield? Usually, the drainfield for a home can fit within the front yard or the backyard of a typical 1-acre home site. Sometimes smaller lots can be used. The precise area requirements will depend upon the kinds of soils at the home site, the size of the house (the number of bedrooms), the topography of the lot, and the type of on-site system used there. A site with clayey, slowly permeable soils needs a larger drainfield to absorb the sewage effluent than does a site with sandy, permeable soils. A home with five bedrooms will need a larger tank and drainfield area than a home with three bedrooms. A rental property at the beach may require a larger drainfield than a similar-sized permanent residence with the same number of bedrooms. A home using one of the newer, more advanced types of on-site technologies may be able to use a smaller area for the drainfield than if a conventional septic system is installed. Adequate land area must be available to achieve adequate setback distances from any nearby wells, springs, streams, lakes, or other bodies of water located either on the lot or off-site. There also must be enough area to install a second system, called a replacement system, in case it is ever needed. This replacement area (sometimes called a repair area) also must have acceptable soil and site conditions and must be left undisturbed and available for system replacement. Be aware that the type of on-site system required for use in the repair area could be a completely different, more sophisticated type of on-site system. Hence, if that repair area is ever needed, you might have to install a more expensive system than the original system installed when the lot was first developed. What Legal Requirements Regulate Septic Systems? State law requires that soils be evaluated by the local health department and that an I.P. and a C.A. be issued before house construction begins or the septic system is installed. The I.P. allows the site to be used, while the C.A. determines what type of system must be installed. Sometimes these are issued at the same time by the health department. An I.P. is good only for five years unless it is renewed, or unless it is issued under special conditions for a lot that has been professionally surveyed. If a permanent I.P. is issued, then you have some limited guarantee that the lot can be used (even if the state rules change), assuming that the conditions on the lot or the intended use don’t change. Nevertheless, the type of system that will be required as well as home size and location are not assured until the C.A. is issued. Contact your local health department to be sure that you follow the correct procedures and that you are fully aware of the limitations that will protect your investment. Also, the installation must be approved by the health department and an operation permit (O.P.) must be issued by the health department before electrical service can be permanently connected to the home and the septic system put into use. Once the home has been occupied and the system put into use, you will need to contact the county health department if you plan to add on to the home, install a pool, build an outbuilding, or engage in activity that requires a building permit. First, obtain an authorization from the county health department to make sure that the septic system and repair area remain intact and are properly sized for the proposal. Both the septic tank and the drainfield must be properly maintained for the standard conventional septic system. With conscientious maintenance, the system should work correctly for many years. Such maintenance begins with water use and waste disposal habits. Your family will determine which materials enter the system, so you should establish family rules for proper use and maintenance. The suggestions outlined in the box will save you anguish and money when applied to most conventional systems. If your system has an effluent filter, it will need checking and servicing approximately every 2 to 3 years. While this could be done by a homeowner, it is a messy, unpleasant task and there are potential safety issues because of the germs in the sewage and toxic gases. For most people, it would be appropriate to hire a company that specializes in septic system maintenance and service to inspect and clean the effluent filter. Special types of pretreatment units and drainfield distribution technologies also must be carefully maintained for the more advanced, newer technologies described earlier. These newer technologies will be more expensive to operate and maintain than the traditional, conventional septic system. Most advanced on-site and cluster wastewater treatment systems require regular inspections and professional maintenance. Research conducted in North Carolina has shown that about 40 to 50 percent of the advanced systems will fail within 6 years if this maintenance is not provided. Therefore, in North Carolina, a professionally trained, state-certified “subsurface system operator” hired by the homeowner is required by the O.P. to provide the needed inspections and maintenance for advanced technologies. For more information about these requirements, contact your local health department or the state Water Pollution Control Systems Operator Certification Commission. Note, however, that individual homeowners are allowed to take the same training programs and state licensing exam as the professional operators. If they pass the exam, they can operate their own system by themselves. Because this generally is not done, most homeowners will have to pay for this service if they have one of these more advanced technologies. Regardless of whether a professional operator is hired, it is the home-owner’s responsibility to assure proper use, inspection, operation, and maintenance of any type of on-site wastewater system. Make a diagram showing the location of your tank, drainfield, and repair area. Have the solids pumped out of the septic tank periodically. Maintain adequate vegetative cover over the drainfield. Keep surface waters away from the tank and drainfield. Yes. After a few years, the solids that accumulate in the septic tank should be pumped out and disposed of at an approved location. If not removed, these solids will eventually overflow, accumulate in the drainfield, and clog the pores (openings) in the soil. This blockage severely damages the drainfield. Although some clogging of soil pores slowly occurs even in a properly functioning system (the biomat described earlier), excess solids from a poorly maintained tank can completely close all soil pores so that no wastewater can flow into the soil. The sewage effluent will then either back up into the house or flow across the ground surface over the drainfield. If this happens, you may need to construct a new drainfield on a different part of your lot. Pumping the septic tank after the soil drainfield has become completely clogged will not rejuvenate the system. It will provide only a few days of reprieve until the tank fills up again. Once the soil has become completely clogged, it is usually necessary to install a new drainfield or an advanced pretreatment unit, or both. This can have a significant negative effect on your landscaping and yard, as well as being expensive. An ounce of prevention is worth a pound of cure with septic systems. The frequency with which you will need to pump depends on three variables: the tank size, the amount of water used by your family, and the solids content of your wastewater. If you are unsure about when to have the tank pumped, have a professional operator observe the rate of solids accumulation in the tank each year. He or she can clean and replace the effluent filter cartridge in the tank at the same time. The tank should be pumped if the sludge layer at the bottom of the septic tank has built up to within 25 to 33 percent of the tank’s liquid capacity or if the scum layer in the tank is more than 4 to 6 inches thick. Therefore, a typical 1,000-gallon tank with a 4-foot liquid capacity should be pumped when the solids reach 1-foot thick in the tank bottom. If the tank is not easily accessible and the rate of solids accumulation cannot be checked yearly, then you may wish to inspect and pump it according to the frequency guidelines in Table 1. Your local health department should be able to tell you the size of your tank. When inspecting the tank, check the effluent filter (or for older systems check the sanitary tee or the outlet baffle to be sure that it has not broken off and dropped into the tank). Also, be sure to have both compartments of the tank pumped (note the two compartments shown earlier in Figure 2). If the septic system is not used very often (as in an infrequently used vacation home with a correctly sized tank), it will probably not need to be pumped as frequently as indicated in Table 1. If you use a garbage disposal, the tank may need to be pumped more frequently. After a few inspections, you should be able to adjust the schedule according to the rate at which solids accumulate. Table 1. Estimated septic tank inspection and pumping frequency (in years). Source: Adapted from "Estimated Septic Tank Pumping Frequency," by Karen Manci, 1984, Journal of Environmental Engineering. Vol. 110(1):283-285. Do not pour cooking greases, oils, and fats down the drain. Grease hardens in the septic tank and accumulates until it clogs the inlet or outlet. Grease poured down the drain with hot water may flow through the septic tank, but then it can clog soil pores completely and ruin the drainfield. Pesticides, paints, paint thinners, solvents, disinfectants, poisons, and other household chemicals should not be dumped down the drain into a septic system because they may kill beneficial bacteria in the septic tank and soil microorganisms that help purify the sewage. Also, some organic chemicals will flow untreated through the septic tank and the soil, thus contaminating the underlying groundwater. If your home has a water treatment system, such as a water softener, the discharge pipe from the backwash should not be connected to the waste plumbing system or septic tank. No. These products include biologically based materials (bacteria, enzymes, and yeast), inorganic chemicals (acids and bases), or organic chemicals (including solvents). Research conducted to date on three of these types of bacterial additives has not shown any reduction in the rate of solids buildup nor increases in bacterial activity in the septic tank. Therefore, they do not seem to reduce the need for regular pumping of the septic tank. Some additive products contain organic chemicals and may even damage the drainfield or contaminate the groundwater and nearby wells. Is Special Care Needed for the Drainfield? Yes. The drainfield does not have an unlimited capacity. The more water your family uses, the greater the likelihood of problems with the septic system. Water conservation practices can help reduce the amount of wastewater generated in the home. Periodically check your plumbing for leaky faucets and toilets. Uncorrected leaks can more than double the amount of water you use. Many soils can absorb the 200 to 250 gallons of sewage usually produced each day by a family of four, but these soils would become waterlogged if an extra 250 gallons were added. For more information on this subject, see North Carolina Cooperative Extension publications WQWM-75/HE-250, Focus on Residential Water Conservation and WQWM-76/HE-213, Water Management Checklist for the Home. Be sure that foundation drains, roof waters, gutter waters, and surface waters from driveways and other paved areas do not flow over the septic tank or the drainfield. Careful landscaping can help direct excess surface waters away from the system. The septic system is an efficient, inexpensive, and convenient method for treating and disposing of household wastewater. Because not all soils are suited for conventional systems, comprehensive soil and site investigations must be performed before you purchase any land. Septic systems will adequately absorb and purify wastewater if they are properly maintained. Contrary to popular belief, septic systems are not maintenance free. Money that is saved by not paying a monthly sewer bill should be set aside for regular inspections and maintenance. A few precautions can save you anguish and money. Reducing water use, avoiding grease, cleaning the effluent filter, pumping the tank periodically, and properly landscaping the yard to keep surface water away from the tank and drainfield are inexpensive precautions that can help assure your system a long life. The North Carolina Cooperative Extension publication AG-439-22, Septic System Owner’s Guide, summarizes some important day-to-day management and periodic maintenance activities to improve your system’s longevity. When properly located and maintained, your system should provide years of trouble-free, low-cost service. Mancl, K.M. 1984. Journal of Environmental Engineering, Vol. 110(1):283–285. This publication is a revision of an earlier version.